The Maintenance elements are defects, changes, issues and tasks. A Package is a namespace as well as an element that can be contained in other package's namespaces. An Issue element is a structured comment that contains information about defects and issues relating to the system/model. Affected elements are connected by Trace connectors. A Change element is a structured comment that contains information about changes requested to the system/model. Affected elements are connected by Trace connectors. A Task element defines a task attached to an element, that enables resources to be assigned specifically to the task rather than just to the parent element. You can monitor these tasks on diagram Gantt charts. A Test Case describes what must be set up in order to test a particular feature. An Entity is a stereotyped element that represents any general thing not captured by the element or Class type elements (for example a trading partner). Use of this element is deprecated: it was originally intended to take the role now occupied by a Table element. To add an element to the current diagram, click on the required icon, and drag it into position on the diagram. Set an element name and other properties as prompted. 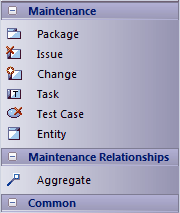 To add a relationship, click on the required icon, then click on the start element in the diagram and drag to the end element.